Contacts: e-mail, instrument scientist: Jan Ilavsky, 630-252-0866 and Ivan Kuzmenko, 630-252-0327. Before applying for beamtime, contact instrument staff and talk with them! General User (GU) program (see "All about proposals here"). We provide about 80% of available USAXS beamtime to users this way. Mail in program. See below for details. We provide about 5% of available USAXS beamtime to this program. Other methods: Proprietary research is available as part of GU program and we also support SAXS-SANS collaboration mail-in program. Mail in program: We make available about 2-3 days of beamtime per cycle to users, who have smaller sets of samples (typically less than 20 samples). Typical use is exploratory research (before applying for beamtime) or when project requires limited number of samples. No beamtime proposal is necessary and users cannot come for experiments to the APS. Samples will be handled by USAXS staff and reduced data will be sent back to users. For details see dedicated page. 2018 interesting USAXS science highlight. Schematics of USAXS instrument. For illustration only, NOT for publications. For latest updated drawing please contact beamline scientist. 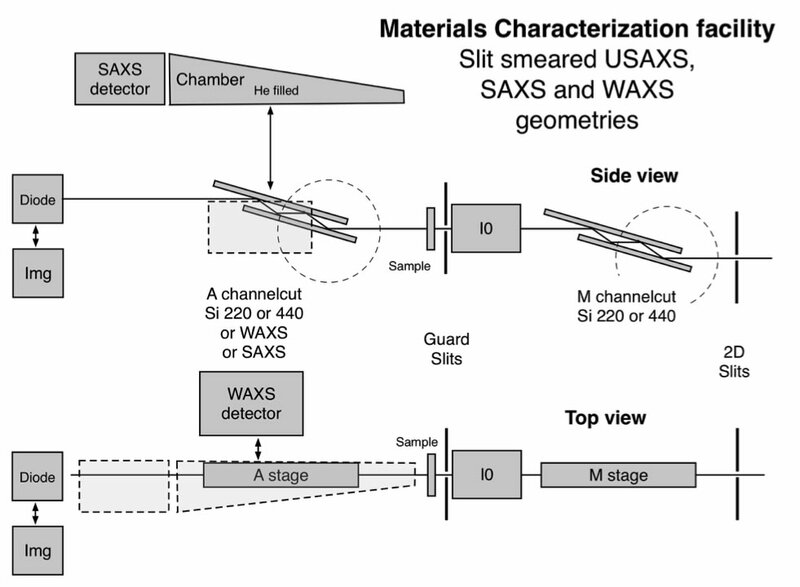 Schematics of the USAXS - SAXS - WAXS instrument with all three geometries. Data are collected sequentially using the three devices. Change over time between detectors is about 30 seconds. 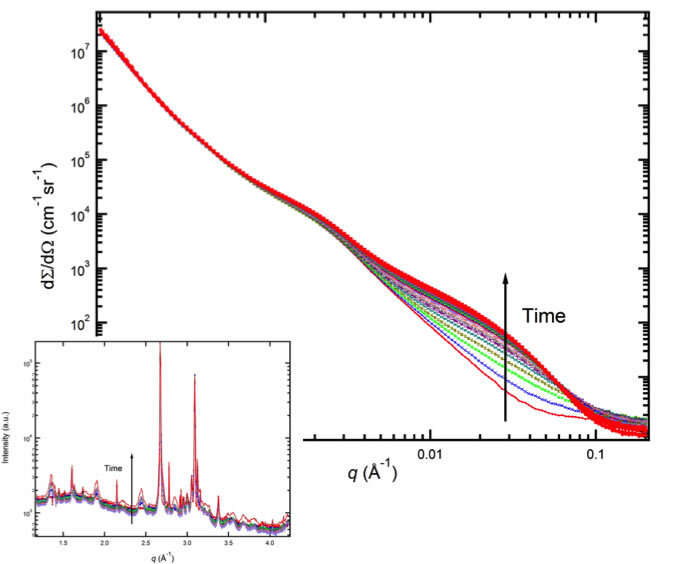 An in-situ USAXS-SAXS-WAXS study of precipitate dissolution and size evolution in a model gamma-gammaPrime ternary Ni-based alloy (collaboration with Dr. G. Muralidharan, ORNL). 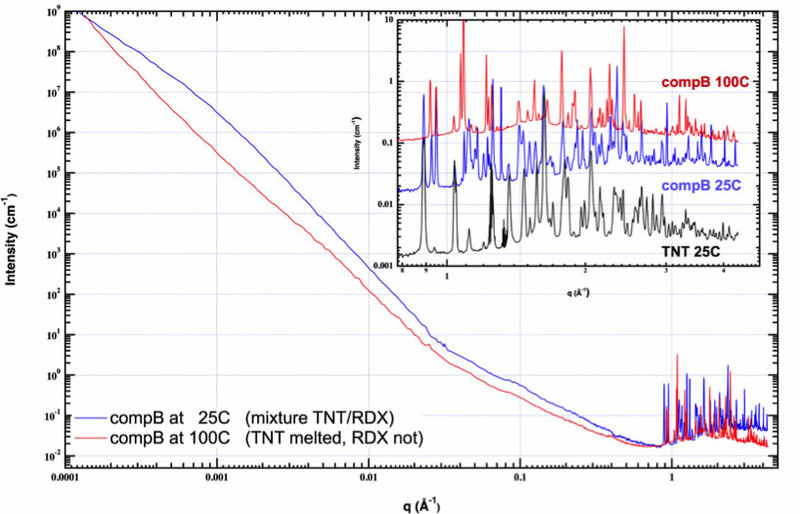 A 0.1 mm thick sample was heated from RT to 1100C at 4.5C/min while undergoing repeated USAXS-SAXS-WAXS (24 keV) at 5 minute intervals. Research sponsored by the U.S. Department of Energy, Assistant Secretary for Energy Efficiency and Renewable Energy, Office of Vehicle Technologies, as part of the Propulsion Materials Program. USAXS/SAXS/WAXS data : In situ data collected at 226 °C over about 16 hours represent microstructure evolution of AA2024 aluminum alloy (Allen, Levine, and Zhang, NIST). USAXS data enable quantification of second phase formation (size and volume), WAXS enables phase identification. 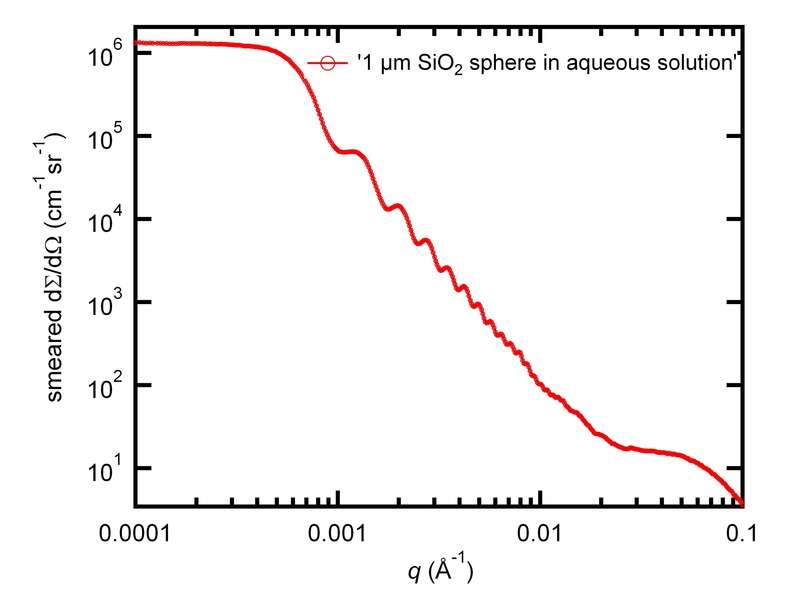 Scattering of 1 micron SiO2 spheres in aqueous solution. USAXS/SAXS/WAXS in situ data : Data collected by LLNL (Trevor Willey et.al.) on high-explosives. The material is composite of two high-explosives and plastic binder. The WAXS clearly shows phase changes while USAXS/pinSAXS data show microstructure change as function of heating. Scattering of 1 micron Polystyrene spheres in solution.